With the series under their belt, India would look to sign off on a winning note before heading off to the gruelling trip to Australia when they take on a spirited but inconsistent West Indies in the fifth and final One-dayer, in Chennai, on Sunday. Stand-in skipper Virender Sehwag single-handedly plundered the West Indian bowling to not just become only the second batsman to notch up an ODI double hundred but also give India a decisive 3-1 lead in the five-match series in Indore. This win is also Sehwag's first series triumph as captain. Sehwag is leading the side as regular captain Mahendra Singh Dhoni has been rested. Statistics show that Indian dominance over the Caribbean team has been on the rise during the last decade and weather-permitting it is expected to continue even in Sunday's match. Fortunately for cricket fans in Chennai, who have seen abandonment of domestic matches due to inclement weather in the recent past, sun has come out brightly and it has not rained during the last a week or more. Top-order Indian batsmen like Rohit Sharma and, Virat Kholi have been among the runs in the series. Sehwag, who was struggling till the last match, roared back into form with the epic double hundred in the previous game. On the bowling front, off-spinner Ravichandran Ashwin has not performed to his potential in the series but would be egged on to strike as he would be bowling before his local fans. Irfan Pathan is likely to find a place in the eleven since the series is already in India's pocket and it would give a chance for the selectors to see the Baroda bowler in action. For the West Indians, it has been a tough tour of India having lost the three-match Test series but the Darren Sammy-led side would be happy with the way they had cornered India in Ahmedabad. Caribbean top-order batsmen have not found their rhythm in unison but have scored at an average of above 25 runs in each match. Sammy expects a much-improved show by his players, focusing on winning the last match though the series has already been decided. "We think we can still win matches. We will approach the game in the morrow like the way we do every game to keep motivated in not losing focus since the One-day series had already been decided," he said. Kemar Roach (7-228) and Rampaul (6-185) have been the most successful bowlers and it is possible that Sammy play might three spinners as the chepauk turf is known for its slow turn. The visitors would be desperate to avoid a loss before heading home but the Indians are not expected to concede even an inch. India: Virender Sehwag (Capt. ), Gautam Gambhir, Suresh Raina, Virat Kohli, Rohit Sharma, Parthiv Patel (wk), Manoj Tiwary, Ravichandran Ashwin, Ravindra Jadeja, Rahul Sharma, Ajinkya Rahane, Irfan Pathan, Abhimanyu Mithun and Vinay Kumar. 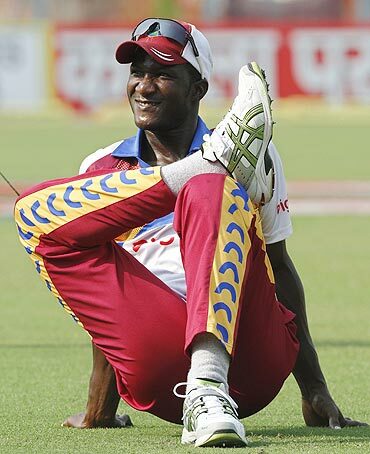 West Indies: Darren Sammy (Capt. ), Darren Bravo, Anthony Martin, Sunil Narine, Kieran Powell, Ravi Rampaul, Andre Russel, Lendl Simmons, Adrian Bharath, Danza Hyatt, Jason Mohammed, Kieron Pollard, Denesh Ramdin (wk), Kemar Roach and Marlon Samuels.